Matthew MacDougall is an artist working in Encaustic and Mixed Media. Encaustic is "Painting with hot wax", and because the material changes from a molten to a solid state in a matter of seconds, is an exciting medium that presents a unique set of challenges to work with. These challenges, however, also serve as opportunities as Matthew's paintings often take on a sculptural quality as the pigmented wax is layered, fused, pushed, and sometimes combined with elements from nature. The work is abstract, exploring concepts such as texture, transparency, depth, and ambiguity. Inspiration for Matthew's work is derived from a love for, and connection with the natural environment. Alicia Landesman is an artist native to Michigan currently residing in Linden who specializes in original large abstract paintings – primarily Acrylic paints and inks on canvas. Her inspiration flows from nature’s balance of light, color, and majestic creations, which integrate seamlessly with current home design trends. 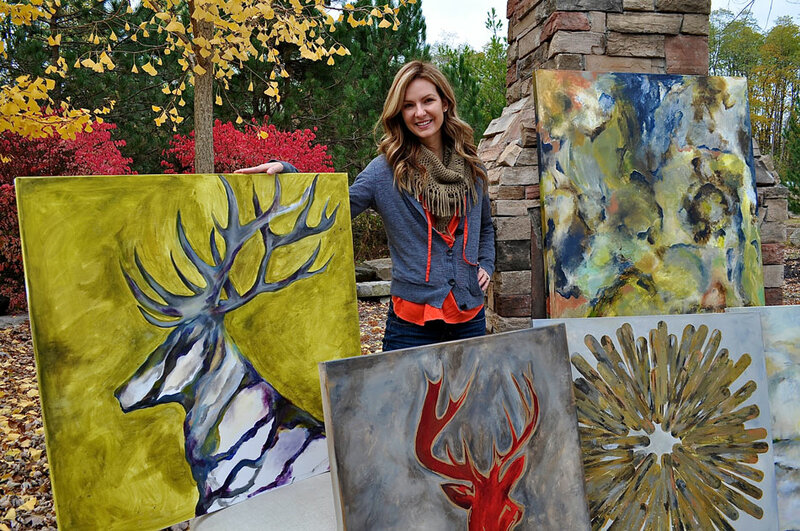 Since leaving her position in medical sales six years ago, she has been commissioned for home makeover projects, charity art auctions, and sold pieces to both commercial and residential buyers. Her work has been featured in multiple juried art shows and is displayed in multiple businesses and boutiques. Most recently, Alicia has partnered with the interior design studio Chatham House at Plum Hollow. In her free time, Alicia enjoys spending time outdoors with her husband, five-year-old son, and three-year-old daughter. She is an avid gardener who loves to cook and can fresh fruits and vegetables. You can see more of Alicia’s art on Facebook at Abstract by Alicia.